How do you teach your children the Bible? Do you use a boring study that is made for adults? Or do you use Wizzy Gizmo? 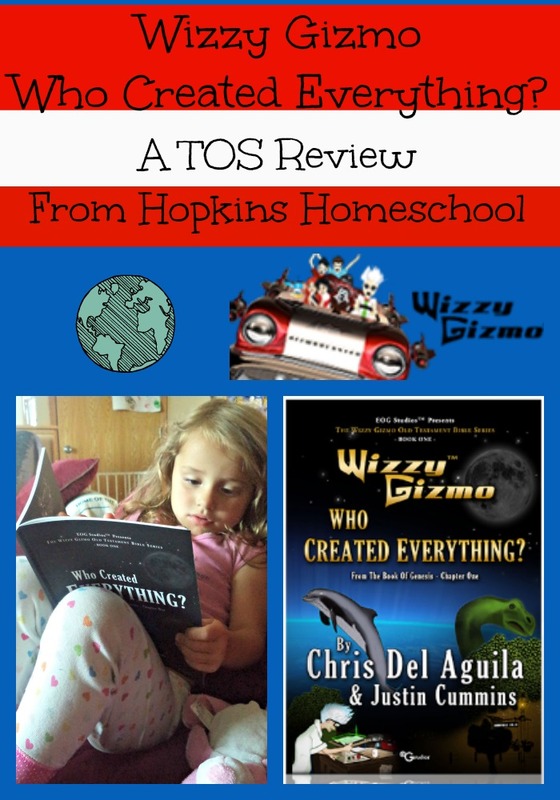 Although not a full Bible Study, Wizzy Gizmo took our family on an adventure in Book One: Who Created Everything? which is from The Book of Genesis – Chapter One. Book One: Who Created Everything? is a book about Genesis. This is not just any book about the bible. This softcover book is a 50+ page adventure that took our family through the days of creation with Wizzy Gizmo and his crew of friends. This is not a full study of any sorts. It is not a curriculum, it is simply a fun book to read that still teaches your family about the bible, days of creation to be exact and who created everything. However, this book, although just a book, is more than just a book! If that makes sense. This is an illustrated book, with beautiful pictures. There are words in bold throughout the book, and a glossary of those words at the end of the book. Heck, there are even simple review questions at the end of the book! So like I said, although it is just a book, it is more than a book at the same time. We used this as a read aloud book. With 50+ pages, I thought it would be a little while worth of reading. However, with the simple reading and wonderful story, we made our way through this book in no time! I, of course, made Moe Man work on the vocabulary words as we went along. Not only did we learn the words and the meanings, but I was able to have him work on his handwriting as he as copying them down in his notebook. I used the review questions for the whole family. I didn’t make anybody write them down, but we talked about them together and worked on memorizing the days of creation through this. Well, when the kids asked if we got to get book two for a review, I knew they loved the book! We all joked about the name a little bit…but that name has stuck with us. 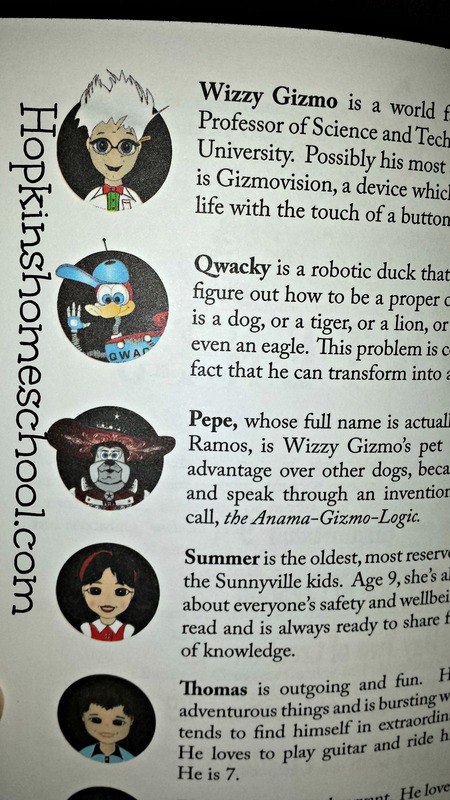 We have been learning about the days of creation in our Bible studies, but to add in the fun of Wizzy Gizmo and the Gizmovision helped us even more. I really enjoyed having the vocabulary words in the back that has helped with some of the words that even I had a hard time explaining, like firmament…I “know” what it is, but to try and describe it was hard…but hey, Pepe helped me out while explaining the meaning to Qwacky. The characters all interacted with each other on such a fun level, that we felt as though we were there with them and witnessing the miracles with them. It has been awhile since we found a book like this. The age range of this book is ages 4-12, but I would not say that it is a reading level for most 12 year olds. It would be an easy, fun read for them. Moe Man, being almost 14 enjoyed the book and Little Miss, being 3 also enjoyed it. The price is $12.99, and for it not being hardcover and only 50+ pages, it is a bit steep. I feel that it is worth it after reading it, and knowing that my kids will be reading it time and time again. Little Miss has already started telling the story to her animals! I loved this book as much as the kids. I loved having the Bible verses worked into the story and being a part of the story, all the while still having a fun and engaging story that the kids will remember! I am interested in Book Two, so I hope you will click below and head on over to see the other reviews with me!